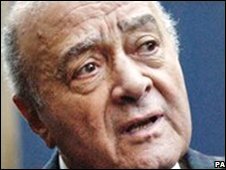 Harrods owner Mohamed Al Fayed will not face charges over claims he sexually assaulted a 15-year-old girl, the Crown Prosecution Service (CPS) said. The allegations emerged in May, when it was claimed he assaulted the girl at his central London department store. He was questioned by the Metropolitan Police in October under caution but the CPS said there was "no realistic prospect of conviction". Mr Al Fayed said he was "shocked" at the police handling of the case. He had strongly denied the allegation that he kissed the girl at his exclusive Knightsbridge store. The first he knew of any allegation, let alone a complaint to the police, was when a story appeared on the front page of a newspaper, he claimed. "I have to ask why it took so long and why it was handled in such a way as to cause me and my businesses the maximum degree of damage," he said. "This should never be permitted in a democratic society." He added: "I am shocked that the system can be manipulated in such a way." A spokesperson for the Metropolitan Police said: "[We] received an allegation in May 2008 of sexual assault on a girl under 16. "As a police service we have a duty to investigate all allegations of this nature and present any findings to the CPS for due consideration. "The proportionality and necessity of any action has been of uppermost consideration throughout the investigation." A CPS spokesman said: "Having reviewed statements and other material submitted to us, we concluded that, in the light of the conflicting evidence and the absence of sufficiently reliable accounts of crucial events, there was no realistic prospect of conviction." Mr Al Fayed's UK business interests include the Premiership football club Fulham. Despite living in Britain for decades, the multi-millionaire businessman has repeatedly been refused a UK passport. Last year an inquest rejected his claim that Diana, Princess of Wales, was killed by intelligence agents because she was pregnant with his son Dodi's child and they were about to announce their engagement.